Dark Energy Mission - Universe Galaxies And Stars Section. A new space telescope concept has been chosen by NASA to help uncover the source of dark energy; the mysterious force accelerating the expansion of the Universe. Called Destiny, or the Dark energy Space Telescope, the orbiting observatory would detect and observe more than 3,000 supernovae over the course of 2 years. This data will help Astronomers trace back the expansion of the Universe, and calculate if the rate of acceleration has changed over time. If all goes well, it'll launch in 2013. Artist impression of the Destiny spacecraft. A team led by the National Optical astronomy Observatory (NOAO) and NASA’s Goddard Space Flight Center has been selected by NASA to develop a concept for a space mission to characterize the mysterious "Dark Energy" that permeates the Universe and causes its expansion to accelerate. 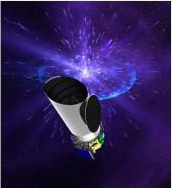 Known as Destiny, the Dark energy Space Telescope, the small spacecraft would detect and observe more than 3,000 supernovae over its two-year primary mission to measure the expansion history of the Universe, followed by a year-long survey of 1,000 square-degrees of the sky at near-infrared wavelengths to measure how the large-scale distribution of matter in the Universe has evolved since the Big Bang. Used together, the data from these two surveys will have 10 times the sensitivity of current ground-based projects to explore the properties of Dark Energy, and will provide data critical to understanding the origin of Dark Energy, which is poorly explained by existing physical theories. "Destiny’s strength is that it is a simple, low-cost mission designed to attack the puzzling problem of Dark energy directly with high statistical precision," said Tod R. Lauer, the Principal Investigator for Destiny and an Astronomer at NOAO. "We build upon grism technology used in the Hubble Space Telescope’s Advanced Camera for Surveys to help us provide spectra of the supernovae as well as images. Spectra are critical to diagnosing the properties of the supernova, but are very difficult to obtain with more traditional cameras. Destiny’s grism camera, however, will take simultaneous spectra of all objects in its field. This is a major advantage of our approach, which greatly increases the ability to detect and characterize these distant stellar explosions." The discovery of a mysterious force now known as Dark energy was announced in 1998 by two independent teams of Astronomers who were studying distant supernovae as a way to measure how the expansion rate of the Universe has changed over time. These teams (both of whom used NOAO Telescopes in Chile to discover the supernovae) were surprised to discover that, rather than slowing down, as had been expected, the expansion rate of the Universe is actually speeding up as the Universe ages. To explain this surprising phenomenon, scientists have been forced to conclude that the Universe contains not only ordinary matter and dark (invisible) matter, but also an ingredient called Dark energy that permeates all of space and propels this expansion. Understanding the origin and properties of Dark energy is probably the most outstanding problem in cosmology today. "Destiny is designed to exploit two complementary paths-supernovae and large scale distribution of matter-to measure Dark energy in a manner that is less susceptible to unknowns than any single technique," said Dominic J. Benford of NASA Goddard, the Deputy Principal Investigator for Destiny. The Destiny team has strong connections to the state of Arizona, with members in Tucson at NOAO, the University of Arizona’s astronomy department and Lunar and Planetary Laboratory, and several Astronomers and space scientists from Arizona State University. Other team members (including several that were part of the original discovery of Dark Energy) are based at the Space telescope Science Institute, Harvard University, Texas A&M, the University of California, Davis, Michigan State University, the University of Chicago, and the Carnegie Observatories. Lauer joined the staff of NOAO in 1990. He was a member of the instrument team for the first Wide-Field and Planetary Camera aboard the Hubble Space Telescope, and was deeply involved in its calibration and early operations. Lauer has continued to be a frequent user of Hubble. In 1992, he received a NASA Exceptional Scientific Achievement Medal for his early work with the instrument. His research covers diverse topics ranging from searching for black holes at the centers of galaxies to the large scale structure of the Universe. Destiny is one concept for JDEM, the Joint Dark energy Mission, which NASA and the Department of energy have jointly proposed to characterize Dark Energy. The Department of Energy’s Los Alamos National Laboratory is a partner in the Destiny mission. If Destiny is ultimately selected to achieve the JDEM scientific goals, the spacecraft and its 1.65-meter telescope would be launched by a Delta IV or Atlas V expendable rocket into a stable orbit at the second Earth-Sun Lagrangian point as soon as 2013. This location allows for stable and continuous operation of the instrument. Initially Destiny would continuously observe two patches of the sky for distant supernovae. Destiny’s observations are planned to coordinate closely with those from current large ground-based Telescopes and emerging facilities such as the Large Synoptic Survey telescope (LSST).